Arsenal's homegrown Super Eagle is finally taking flight. Russia 2018 was supposed to be a chance for Alex Iwobi to stunt on the world stage. 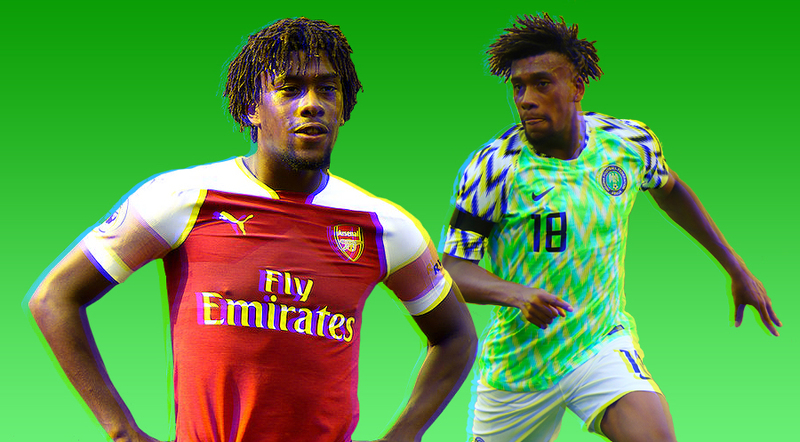 Iwobi was marketed as the star name in a hyped Nigeria squad that began the World Cup with more eyes on them than ever before, partly down to the launch of an Internet-breaking home kit with Nike that was worn by the likes of Wizkid, Not3s and Skepta in the run up to the tournament. Nigeria were a neutral’s favourite and Iwobi, as one of the team’s few Premier League regulars, was the mercurial talent who would unpick Croatia, Iceland and Argentina in the group stages, and follow in his uncle Jay-Jay Okocha’s footsteps as a World Cup legend for all of Naija. It never happened that way. Instead, Iwobi started just one game for the Super Eagles and made two fleeting cameo appearances. His wings were clipped. It’s the disappointment of this past summer that makes Alex Iwobi’s talented resurgence at Arsenal this season all the more spectacular. The 22-year-old picked up the Man of the Match award for his ice cold performance against Leicester and with nine games of the Premier League gone, he’s been the biggest winner of Arsenal’s seismic managerial change at the end of last season. Iwobi has always been a baller with promise but in Arsene Wenger’s final seasons, the Nigerian forward often found himself the target of fan frustration. Iwobi made his debut in the March of 2016 and started of really well. Hasn't developed one bit since then. Losing patience with him. Alongside the likes of Hector Bellerin and Francis Coquelin, Iwobi was scapegoated as a player who wasn’t developing quick enough and wasn’t worth investing in. Some fans believed he was systematic of everything wrong with Arsenal in Wenger’s final act. The truth isn’t quite that simple and in reality, Iwobi’s patchy form was probably a representation of just how suffocating it was to play at the Emirates in front of the #WengerOut crowd. Mistakes were harshly punished and rookie players who need more support than most didn’t always get it. Iwobi has already scored and assisted this season, while his overall play is beginning to look reminiscent of the man he’s all too easily compared with: Premier League legend Jay-Jay Okocha. Iwobi’s play is dripping in sauce, best seen by the passage of play that saw him bring the ball down from a long ball on the volley before turning Wilfred Ndidi inside out with a nutmeg on the turn. This guy isn’t playing anymore. The 22-year-old has always been one of the most likeable players in the Premier League. Whether he’s flexing in Stone Island, chilling with Wizkid or starring in an upcoming Nollywood film, Iwobi lives his life with style, energy and creativity. This season, he’s bringing those same values to the pitch and we’re all here for it. Alex Iwobi’s turnaround since Russia 2018 demonstrates his strength of character and begins to fulfill the potential he displayed when making his first appearances for Arsenal just three years ago. While calls from AFTV dubbing Iwobi the “Nigerian Messi” might be a bit premature, the time is now for Alex Iwobi to keep on upping the levels. The PFA Young Player of the Year award should be in his sights.